Carbs, carbs, carbs. Without a doubt being diabetic, you need to know as much as possible about the whole carbohydrate ordeal. And when it comes to carbs, we get tons of questions on the topic. 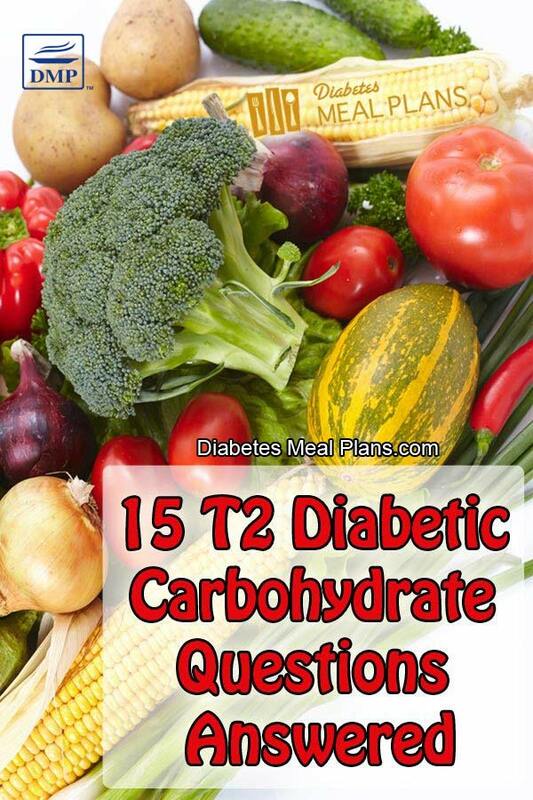 Here we've gather up 15 of those carbohydrate questions with their answers. If you've got a question yourself, leave your comments below and we'll chime in. 1. How much do carbs influence your numbers? A lot. Carbohydrates are the single biggest thing that influences both blood sugar levels and A1C numbers. All carbohydrates break down to glucose, glucose enters your bloodstream (aka: blood sugar level). Different types of carbohydrates do enter the bloodstream at different rates. For instance, a simple carb digests faster, causing a quicker response, while a complex low glycemic index carb will digest slower and cause a slower, steadier rise in blood sugar. But, while the type of carb is important, the total amount of carbs you eat is the major contributing factor to both blood sugar and A1C results. 2. What's the best source of carbs to eat? Many people think of carbohydrates as pasta, bread and rice. While these are carbs, vegetables are also a carbohydrate – the type of carb you want to eat more of. If you decrease your intake of pasta, bread and rice and increase your intake of non starchy vegetables, and you'll be well on your way to better numbers. 3. Do our bodies need carbohydrates? Our bodies do prefer carbohydrates (glucose) as a fuel source. And studies have shown that our brain functions better with glucose as it's fuel source. However, we don't need as much as we've been led to believe. In fact, some research even indicates that neurodegenerative disorders such as Alzheimer's and dementia are the new “type 3 diabetes” – caused by too much glucose in the brain, causing insulin resistance in the brain. It's interesting because carbohydrates are not an essential nutrient. If we didn't eat them, our body can use both protein and fat for energy. And while it's not necessary to follow a no carb diet (that's not recommended), cutting back on carbs has been shown to benefit type 2 diabetics in many ways – lower blood sugar and A1C, improved cholesterol, lower weight loss and so forth. 4. What foods are low in carbs but also filling and healthy? 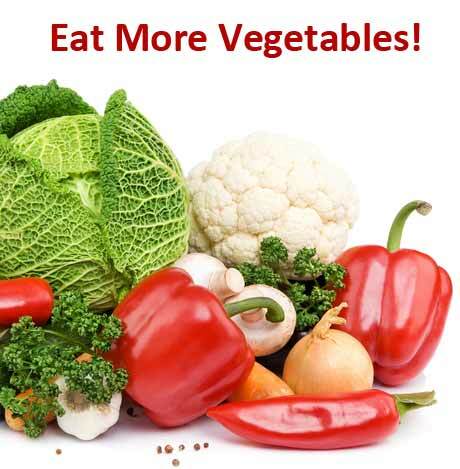 Non starchy vegetables are the lowest in carbs and they are full of fiber, which fills you up. Most people don’t eat enough vegetables so if you feel hungry, load up on more of these 20 all-you-can-eat veggies. You can also increase sources of healthy fat – no, that’s not a free license to go and chow down on all the pork rinds and bacon fat you like, far from it. Those are not healthy options. We’re talking about eating more avocado (try our guacamole dip), nuts, seeds, olives, virgin olive oil, cheese, cottage cheese, and such. 5. Does it help to eat meals prepared with the lowest carb counts? Well it certainly helps to eat meals that are low carb – and most people do need to eat lower carb. But eating low carb doesn't meal eating no carbs either. If you're making recipes that contain 60 g carbs per meal, you're going to struggle to lower levels. On the other hand, sticking to around 20 g per meal seems to be a sweet spot for many people. 6. How many carbs a day am I supposed to have? There isn't one clear definitive answer to this, however, we encourage a low carb diet because research shows it works. Very low carb ketogenic diet: 20-50 g per day. Below 10% intake of 2000 calorie diet. Low carbohydrate diet: Below 130 g per day. Below 26% total energy intake. Our meal plans are based on an average 80 g/ day carbs (which seems to be a sweet spot) but some people can go as much as 120 g/ day and still do fine. Anymore than that and you may find it more difficult to manage levels. Find a sample 2 day menu over here. 7. Carbs to sugar is very similar in both white and brown rice/ pasta, is brown better solely because of fiber? The short answer is yes. Dr. Robert Lustig once explained that when we eat fiber it forms a lattice-like structure in our gut that dramatically slows down digestion and therefore uptake of nutrients – in this case, namely carbs. The glycemic index (GI) demonstrates this: brown rice is around 50, white rice 65+ depending on the type of rice. Brown rice is low GI, white rice is medium to high GI, depending on the type of rice. It's the fiber that changes this. But, the thing to be careful of with either white or brown rice is that they are both high carb foods. Rice has around 23 g carbs in 1/2 cup. Once you add other meal items on top of this, your carb count is going to stack up, fast. Though some people can eat rice and still manage to keep blood sugar levels under control, majority of type 2 diabetics don't tolerate rice well. 8. Are “low carb” pasta's OK to eat? We've written about low carb pastas before over here and here. And you can checkout our low carb food store for a variety of options. Another alternative – and one we prefer most of the time – is to make zoodles. Read more about how to spiralize vegetables into noodles here. 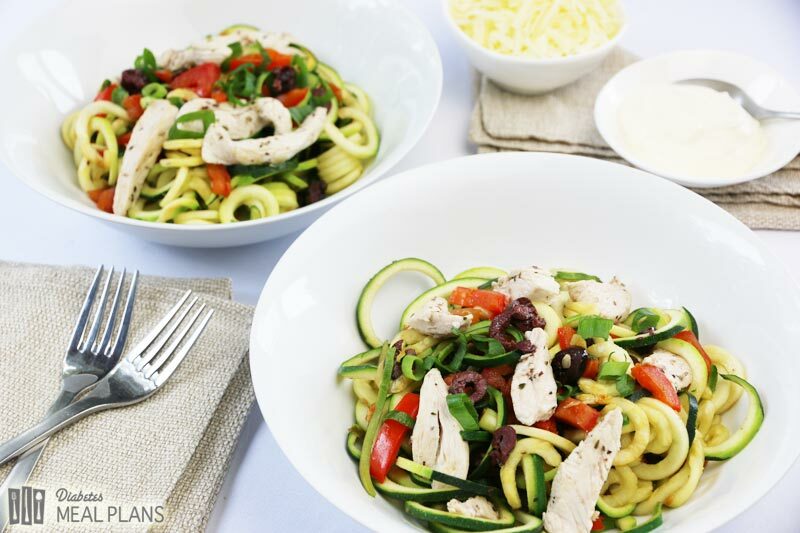 And check out this delicious Olive Herb Chicken Zoodle Salad. 9. Is there a list of foods with their carb /sugar numbers for single servings? This is a question that comes up frequently because it does make it a bit confusing when 10 g carbs of one item is one cup, 10 g of another item is one slice, while yet another is half a cup – how on earth do you get your head around it? You might have seen some lists that point out 15 g carb snacks. But, unfortunately, when it comes to carbs, there are just too many to have one list like Weight Watchers points (though perhaps in future we will try to make one of some kind). The good news is, once you learn the values of the carbs you eat (or if you're learning, their alternatives) then you'll know it. You won't have to learn it again. Stick to this list of foods and you'll find you won't have to count carbs as closely. 10. Can I limit my carbs for breakfast and lunch and splurge a little on my dinner meal for a special occasion? It doesn't really work like that unfortunately. When we eat carbs, our body uses what it can for immediate energy and stores what it can in the liver and muscles for later use, the rest that can't get stored in the liver and muscles, gets stored as fat. So there's only so many carbs our body can handle at any given time. If you skip carbs at breakfast or lunch it won't mean your blood glucose won't go up as much at dinner or if you splurge. In fact, it could mean it goes up more because your body will ‘react' more to the sudden stream of glucose. Overall, what works best is getting your levels under control on an everyday basis. Then, you'll be able to have those occasionally splurges without seeing too much overall impact. 11. How does cooking food change the carb content? This is a tough one to answer because it depends. Some foods won't change a lot, others will increase, and some may even decrease in carb count. If you need to search for reliable food values, try using the NSDA nutrition database. 12. Are vegetables sufficient as carbs without having potatoes or rice as well? Vegetables are carbohydrates and they are the type of carbs you need to rely on, especially non starchy vegetables. These will still add up overall over the day, providing you with ample carbs, but they won't impact your blood sugar like potatoes and rice. 13. Where can you find low carb items? You can find most of what you need at the local supermarket – meats, chicken, fish, eggs, dairy, vegetables and healthy fats like olive oil, avocado and nuts. Farmers markets are a great place to find fresh local produce. Health food stores will have the few unusual things you might need – stevia, low carb flours and such. Netrition is a great online low carb food store. And we also have an Amazon low carb food store where you can purchase things online. 14. What is the the difference between carbs and calories? Carbohydrates are a macronutrient. We have 3 macronutrients – carbohydrates, protein and fat. Calories refers to the amount of energy those macronutrients provide to the body. Both carbohydrates and protein provide 4 calories of energy per gram, fat provides 9 calories of energy per gram. 15. Where can I find meal plans and recipes that I don't have to calculate carbs, fats, sugar, etc? Here at Diabetes Meal Plans, of course. Have you seen our Smart Meal Planner? With our smart meal planner, you can add recipes to the planner from our selection of 500+ low carb meals and it calculates your daily intake for you automatically – calories, total carbs, fat and protein. It's designed to make managing blood sugar and A1C easier! Watch this short video to see how cool our smart meal planner is. This video shows our 4 Week Weight Loss Meal Plan but the meal planner works the same for VIP Meal Planners, too. With a VIP membership (which costs less than one cup of coffee per week), you get access to ALL our meal plans, menus and programs, giving you loads more help to manage your blood sugar. Check out our range of meal plans and menus over here. I first found DMP just before Thanksgiving. OH well! I actually joined in mid January. 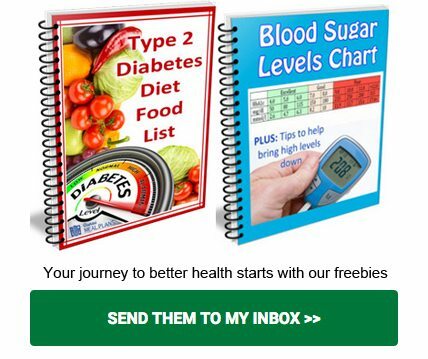 My blood glucose varied from 200 to 250 and I felt very out of control. Now I’m a pretty consistent 160 and slowly going down. I have also dropped 8 pounds. I do the cooking for my wife, daughter and grandson (7) so I am challenged to provide something everyone will eat. I have made some adaptations to some favorite recipes so they work for me and I have learned to just be more selfish about feeding my own needs. not easy. My food desires are relatively simple but really crave some strong tastes periodically. Are half sour pickles OK? Other than the sodium the label is not sending me any warnings. Awesome Jim, that’s fantastic news, well done! Sounds like you’re traveling along well. Yes, most half sour pickles are fine, they are generally low in carbs. I’ve Heard About “no gPS” (Grains, Potatoes,Sugar) for diabetes. Is quinoa allowed? If not what would Be an acceptable alternative? Hi Joy, quinoa is still a high carb food, coming in around 20 g per half cup. You could try it and see how it affects your numbers but in general we don’t recommend quinoa as we encourage a low carb diet. We often recommend cauliflower rice, konjac noodles, or other low carb options. I was diagnosed with Type 2 Diabetes in October of 2015. Could you please Explain to me how to figure out the correct carbs on packaged goods? Hi Jeanette, we are working on a food label tutorial but when it comes to carbs it’s easy. Ignore everything except the total carbs – sugar means nothing because it’s not a reflection of whether a food has natural sugar or added sugar. If you’re counting net carbs, then you minus fiber from total carbs. For instance, if the total carbs are 12 and fiber is 4, your net carbs is 8 – this is the available carbs, as we don’t really digest fiber. It is recommended to start with total carbs (lowering your overall carb intake), so all you have to be concerned about is the total amount of carbs on the label. And one other very important point – check the serving size on the label, as it’s often smaller than we would expect. Jedha, Thanks for the information, I have been using the total carbs, but someone told me about taking out the fiber. So, for now on, I will just use the total. I have been eating the serving size on the labels and I know how small they are, gets you thinking about how we can overeat and not even realize that we are doing it, especially if it is yummy!!! Thanks Again for the info. Glad to help. And yes, the serving sizes are greatly misleading! Often a trip up for many. Both of these cheeses have similar nutrition content overall so you can choose either one William.